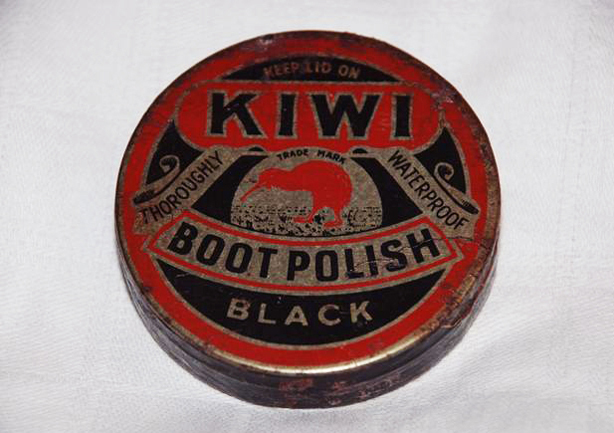 I began a dialogue with someone a few weeks ago about a rather odd looking version of a classic Kiwi shoe polish tin. I used to own some examples in the 1980s – long since parted with – when they were much easier to find for a nominal price, but I haven’t seen one of these before (below). From what I have seen of other well known products that have these anomalies, known not to be misprints, but dating from the 1940s, I conject that this is the result of paint and ink rationing during WWII. The Evening Post,2 November, 1927. 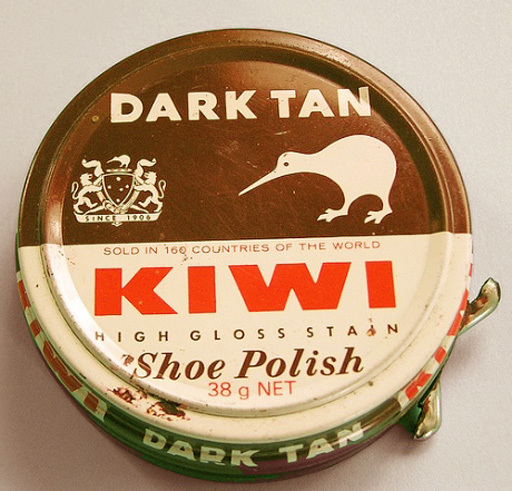 Kiwi has been adopted by New Zealanders as a national brand icon and arguably no other product has been a worldwide ambassador for Aotearoa and it’s flightless, endangered national treasure, like this little can of coloured paste has. It is of course probably little known at this point that much like those of the trans -Tasman names Woolworths, Frosty Boy, Riviera, Sanitarium, and rival polish brand from Reckitt & Colman, Nugget – to name a few – it is originally an Australian creation. I can’t imagine that will please too many people yet again. Unusual version of the classic tin, which probably was the result of paint and ink rationing during the Second World War. 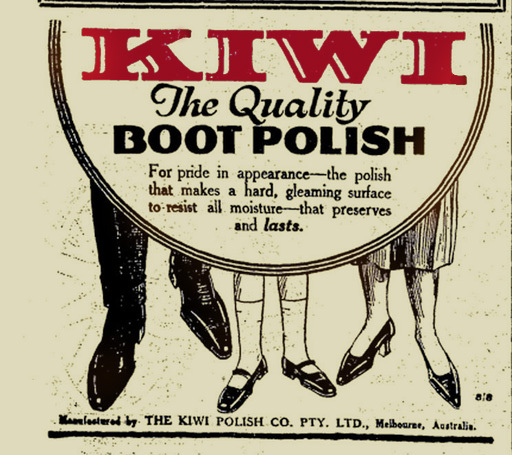 and purports to be one of the earliest film ads around, however Kiwi was first produced in 1906 so it must be after that date and I would hazard a guess that the early to mid 1910s. American-produced promotional matchbook cover, photo courtesy of and © Neocles Serafimidis. it has exactly the same design of borders around its text frames so I think we have the answer to a more exact window of time. 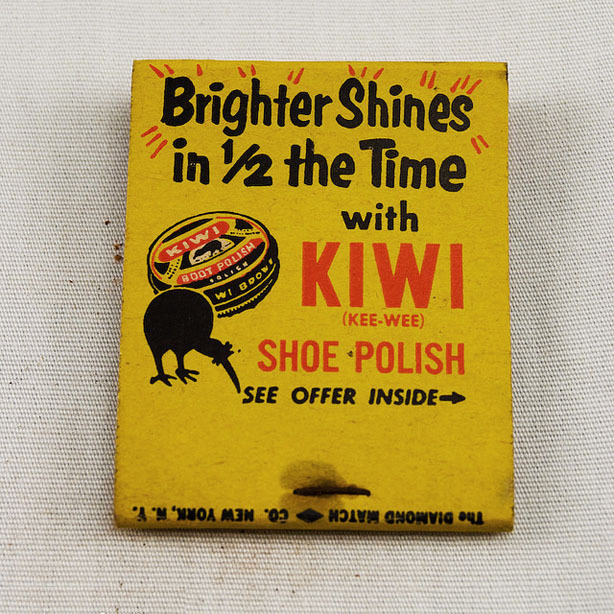 Ramsay’s spouse was a New Zealander and it was during a trip there that he had the privilege to see the shy nocturnal bird and decided that it would be a great logo for the new, fine footwear polish that he had created – of a quality that was the precursor to modern day Brands. A variety of designs from old to new: Contemporary version on left and a 1970s version at centre. Photo courtesy of and © Miranda Hensleigh. It’s great success was spurred during the early years of WWI where the product was adopted by both British and American troops. It was known as the best polish available at the time with superior qualities the others did not have; those of shine and suppleness, water resistance and colour restoration. as a result of this popularity the product’s market had spread over fifty countries by 1924. From a Self Help cook book of 1939. 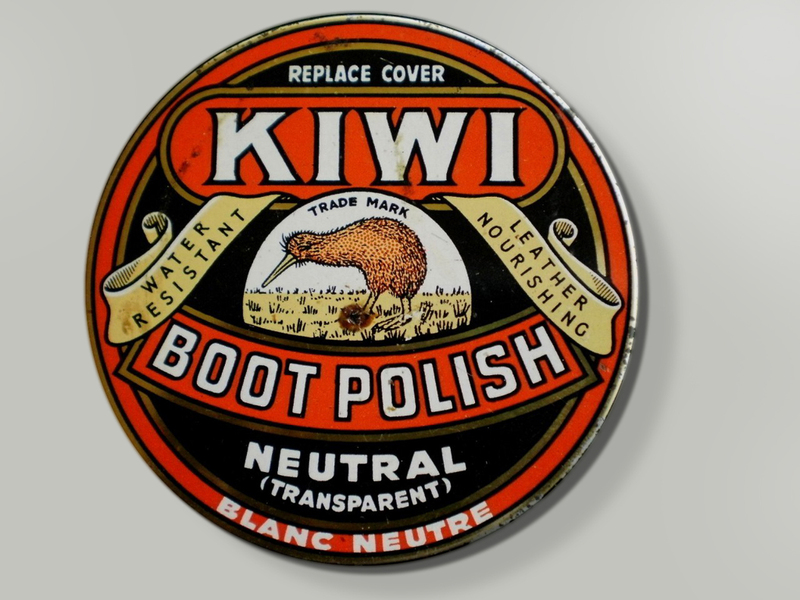 The company name remained more or less the same – Kiwi Boot Polish Co. -until in 1967 when it was rather belatedly updated to Kiwi International to reflect its cemented global success of a number of decades. In 1971 it was acquired by Nicholas international Ltd. to become “Nicholas Kiwi” . The 1980s version of the tin. The company was snatched up by the Sara Lee Corporation in 1984 just following their significant acquisition of Reckitt & Colman. Most recently it was sold off to American Company S. C. Johnson & Son – the makers of Johnson Wax and other household products. Of course it is still going today and is the number one shoe care brand in America, Britain, and Australia as well as New Zealand – and is available in nearly 200 countries worldwide. But for all its popularity and success – this Kiwi just ain’t a native – sorry, folks. 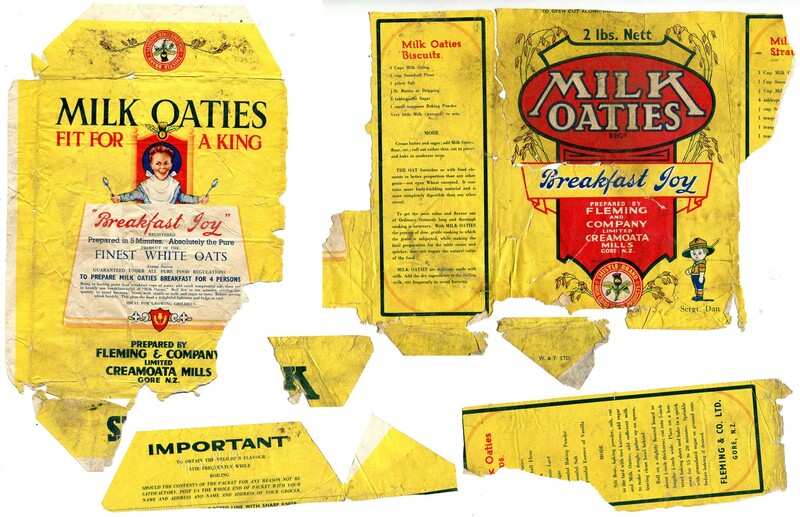 I purchased these scraps of a disintegrating Fleming & Co “Milk Oaties” box from one of my favourite dealers . He always comes with the most incredible stuff – I have no idea where he finds it (and I wouldn’t dare to ask). I have only seen one before in the last five years that I can recall – it was whole but faded. Any of the original Fleming boxes usually sell for a competitive price since the chances anyone would keep one for decades is highly unlikely – and means they are rare and desirable examples of early New Zealand packaging. Anyway, nobody else looking at this would bother, but I could see the potential to patch it back together digitally and restore it and so it was won for a nominal price with no interest at all from other parties. According to my database this design was definitely in production between the years 1938 to 1941 – probably a little earlier, as well as later. Thomas Fleming (1848-1930) is now considered the major pioneer of the milling industry in New Zealand. His parents arrived to New Zealand from Scotland in 1862 with several children and another on the way. Although he initially had jobs in other fields, such as gardener and cowboy, – around 1870 whilst visiting his brother in Oamaru on the lower west coast of the South Island, he got a job harvesting, in the wheat industry in nearby Totara. Late 1950s- early 1960s interpretation of Sergeant Dan from a Happy Families card game set issued by Four Square. Quickly progressing to working in the company’s Kakanui Mill (another source says it was Maheno Valley flourmill, now a well-known heritage building standing as Clark’s Mill ), he had the foresight of great opportunity and had subsequently roped his brother in before the year was out to learn the milling trade with plans for great future success. His vision was true – within three years he had been promoted to manager. In 1875 he left to manage another mill owned by a certain John Murdoch situated in Invercargill, and no more than a year later he found himself – with his new partners, the freshly formed Fleming Gray and Company – the owner of it. Not long passed before not only were they bringing some serious competition to the local industry – but they were also buying up smaller mills for their market share. Advert from a Self Help Co-op cookbook 1939, showcasing the range of Fleming & Co products of that time. Fleming & Co Creamoata Oat Mill in Gore, the Fletcher Trust Archive, 9204P-94. Like the story of many phenomenal industry successes, the entrepreneurial Fleming had a keen interest in innovative technology and marketing – and took many lengthy trips abroad to investigate these aspects. With the completely modernised plant the company was now producing the whitest, finest flour on the market – not mention the most. The combined wood of the building, the heat of the machinery and production as well as the flour dust were a combustible recipe for disaster but out of the flames was borne the cement of Fleming’s empire. By this time, having wiped out all competition – they were the only operating flour mill in the area, having eventually bought out all the others, and shut down many of the smaller ones; and oat production was relegated to Gore where it remained hereon for well over the next century. In 1902 Fleming bought out Gilkinson who went on to establish Southland Frozen Meat Company – and became Fleming and Company Limited. , consisting of himself, his son-in-law John Rennie, who in his own right was a serious player in the industry as manager of the local branch of the New Zealand Flour Millers’ Association; and also William Fleming, (1881-1927), one of his sons. 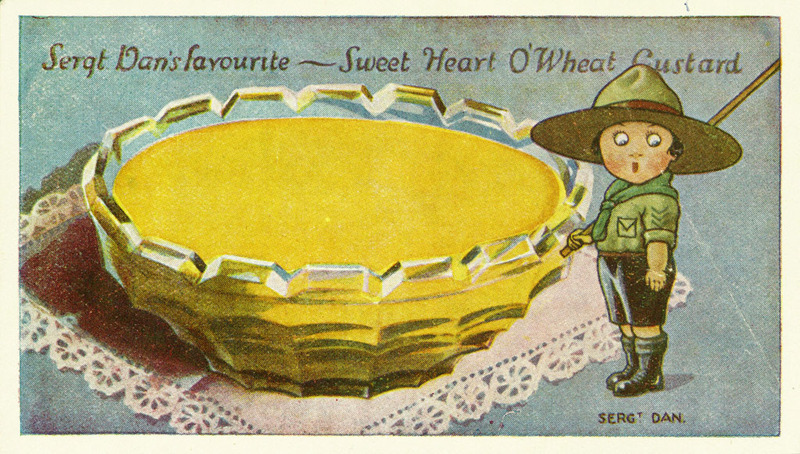 Fleming’s advertisement for the Thistle brand oat products, September 1936. In 1912 Fleming retired and sold his shares in the firm to his sons Andrew, William (and possibly another son Herbert) Fleming as well as partner and relative Rennie. Because the brand was by now a household name subsequent owners over time wisely kept the Fleming name. 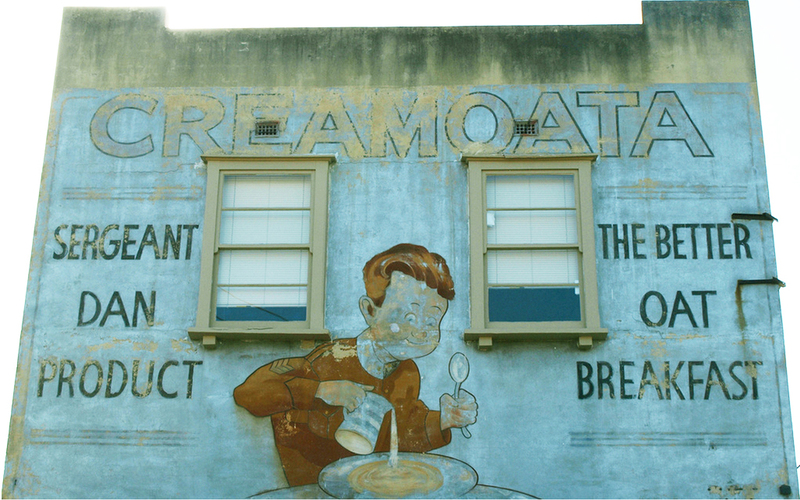 However it’s the later, much-photographed lemon-coloured Creamoata Mill that gained iconic status with its mascot emblazoned on the side for all to see. 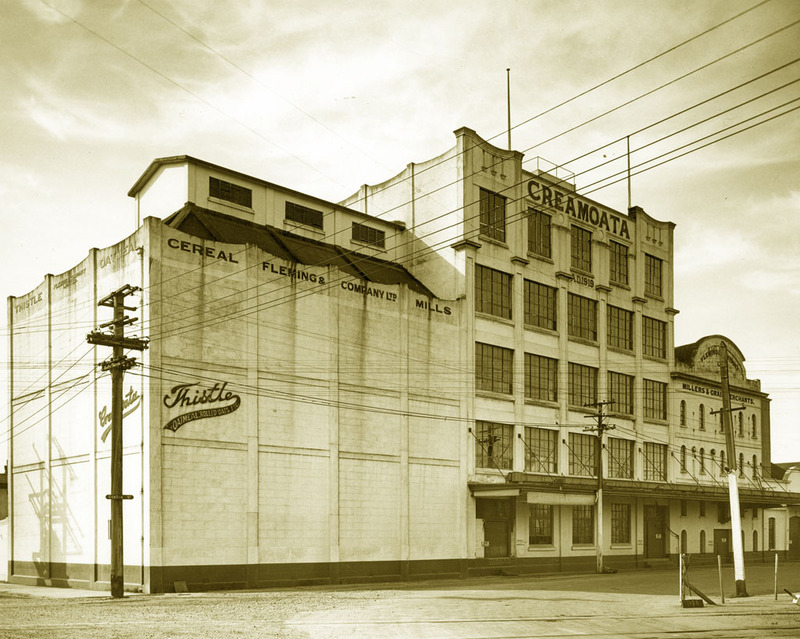 Although the earliest parts of the Gore oat-focussed mill had their foundations in 1893, Fleming extensively rebuilt the newer building emblazoned with the Sergeant Dan character in 1919, probably in relation to their hugely successful new invention Creamoata being released the year previously, and the structure, now known as the “Creamoata Mill Complex”, still stands today with a Category I heritage listing. 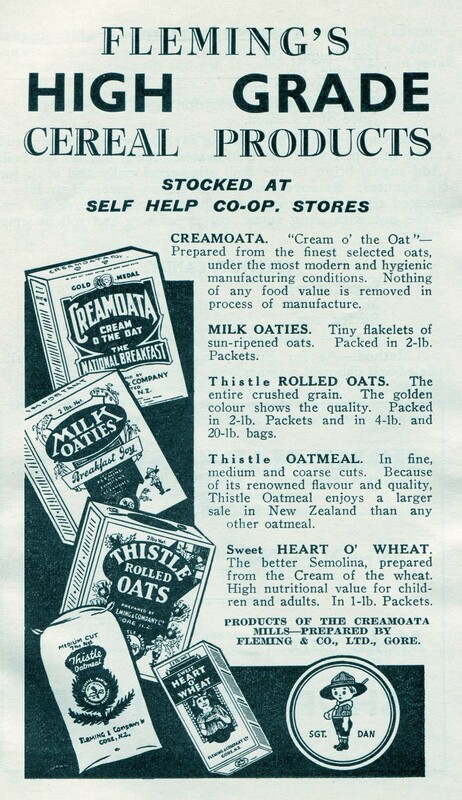 Creamoata was of course the most famous and successful of all their products, and seems to make its first appearance 1909 – it was a finely ground rolled oats product which produced a creamier variety of porridge – an instant hit for the morning meal. 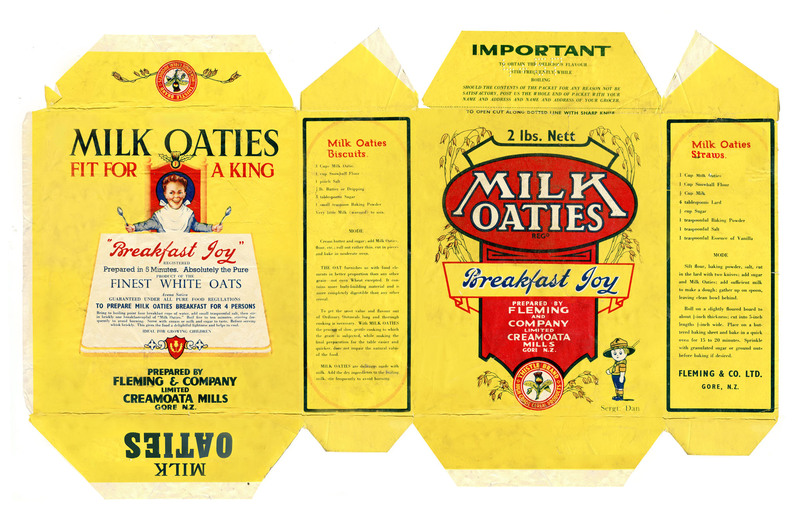 It was supposedly considered the “national breakfast” as claimed on their packaging for decades (debatable – many may say that title is owned by Weet-Bix which was around in Aotearoa almost as long) however over the years Fleming produced and marketed many brands including self-named Fleming wholemeal and white flours, Thistle brand rolled Oats and Oatmeal, Breakfast foods and cereals such as Cream O’ Groats, Milk Oaties, Oatie-Nuts and Sweet Heart O’ Wheat (a semolina product also popular for desserts), and the Snowball brand wheatmeal and white flours. 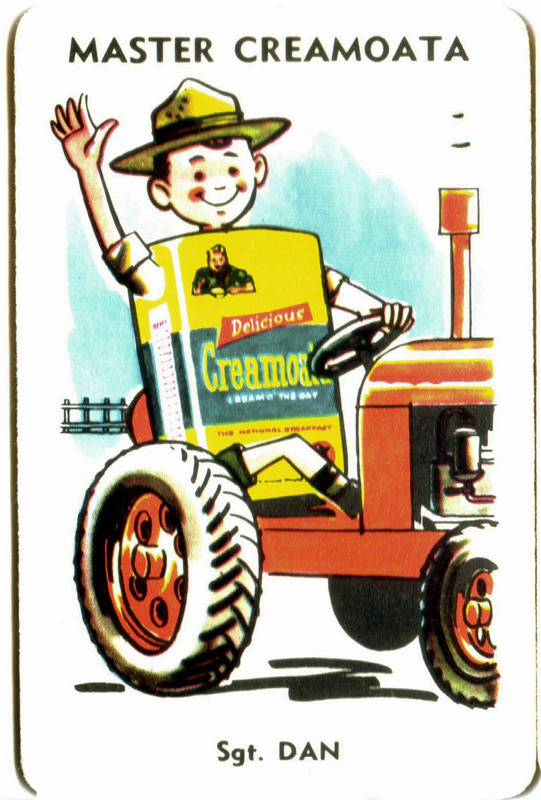 Doctor’s Cream O’ Groats was another that was likely a short-lived product of the 1940s. 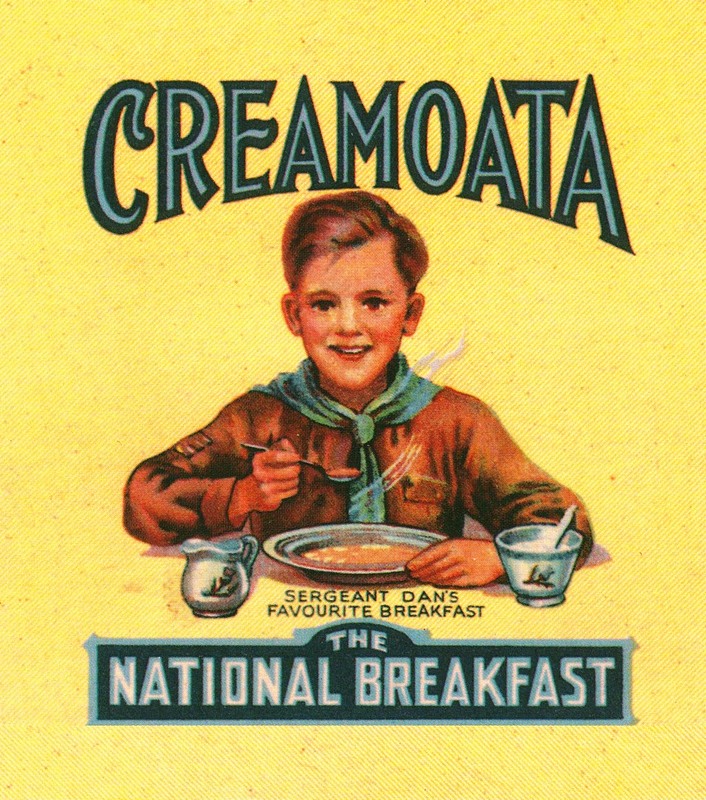 Front of a Creamoata box circa 1950s with the more human version of Sergeant Dan as a boy scout. According to the Historic Places Trust, Sergeant Dan is “as well-known an image in popular culture as Buzzy Bee or an Edmonds Baking Powder tin”. I don’t know if that is true. I don’t recall him at all to be honest – and he may possibly be up there in Kiwiana Icons for Baby Boomers but I doubt that generally he would rank into the top ten amongst thongs, pavlovas, fern leaves and the odd brand name food items that would make it in like Tip-Top, for example. 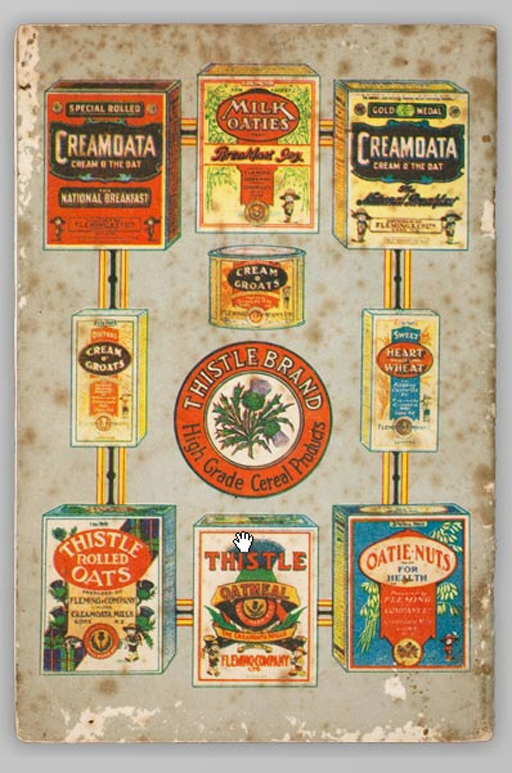 However Creamoata per se was well enough known that it was issued as an eighty cent stamp by NZ Post within their “Millenium Series” under a sub-category of six “Food Nostalgia” designs. 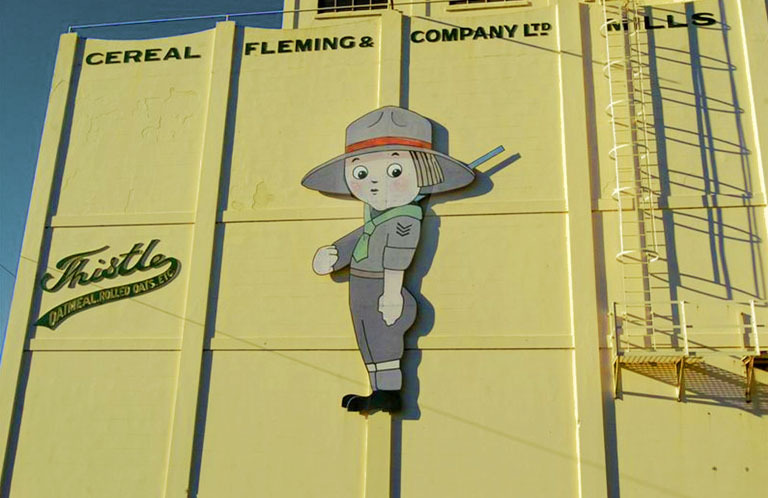 The Creamoata Mill Complex today is owned by a new company making stockfoods under the Sergeant Dan mascot. The last Fleming family members disposed of their interests in the company in 1953 and the business was sold to Northern Roller Mills (NRM) which later became part of Champion, another older mill company going back to at least the 1890s which had become a subsidiary of Wattie’s. An early version of Sergeant Dan, probably in the 1920s not long after Charlotte Lilian Lawlor created him. 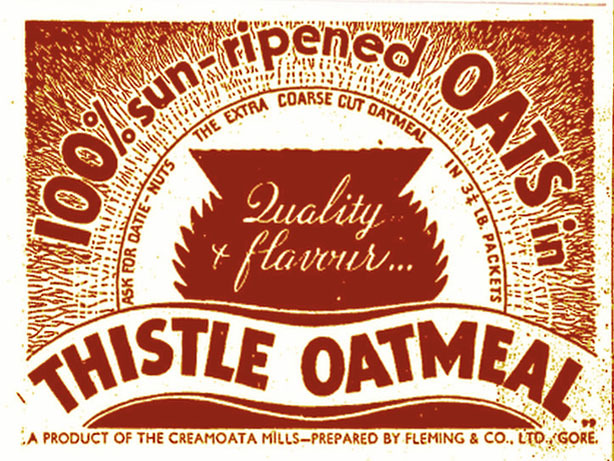 I certainly remember Fleming products in the kitchen cupboards at home into at least the late 1970s for morning porridge; in particular packets of Thistle rolled oats – with a Highlander emblazoned on it – I think it was a blue, green, pink and white print on clear cellophane wrapper. 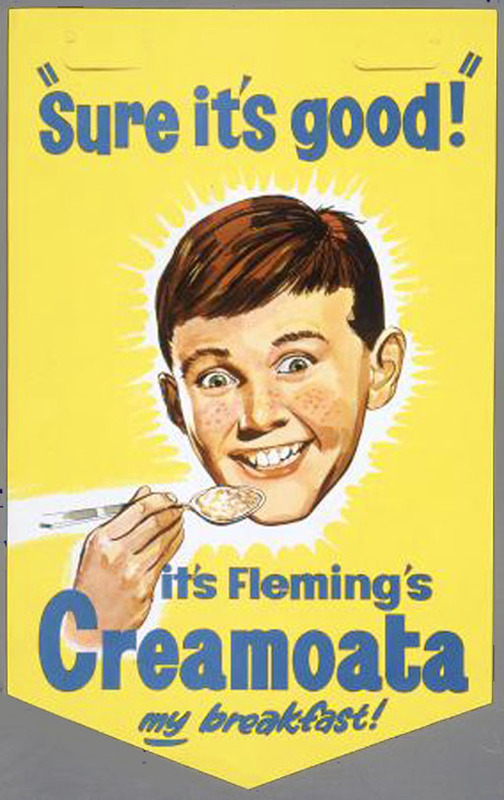 An Australian version of Creamoata signage. Apparently this one in Carlton, Melbourne was painted owner by the new owners of the building not long after this photo was taken. Production was shifted overseas under the Uncle Toby’s brand when Goodman Fielder stepped into the picture and took over from Nestlé in 2006 – up until this time the products had continued to be manufactured domestically in Gore. In late 2008 they confirmed that Creamoata was going to be off the shelves by early 2009 when stock ran down. Fleming’s “Stirring Times” recipe booklet, 1927. Alexander Turnbull Library collection, B-K 879. The only remnants of the Fleming brand remaining today, besides the mill buildings, is a line of health snack bars under the name which have been marketed since the 1980s – and at this time under the auspices of the Bluebird company. 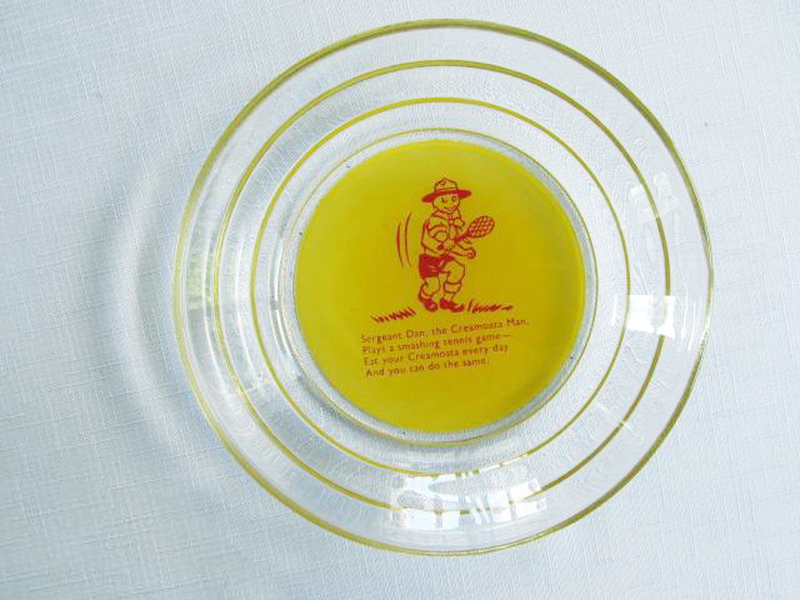 The tennis version of another well-known Creamoata promotional campaign – there were several Sergeant Dan sports activity plates to collect. ”“Now he is a full grown man, But there’s still a Sergeant Dan! Just like Dan in years gone by – Quick of wit, alert and spry! “I advise,” he loves to say, “Some Cweamoata every day! 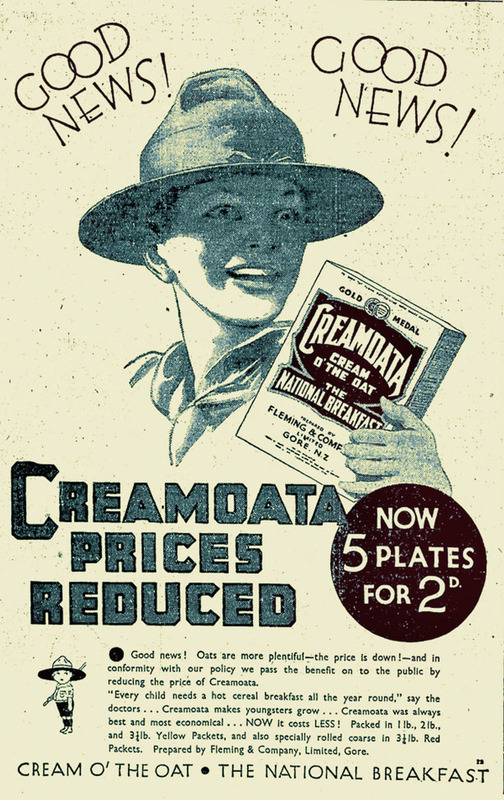 Creamoata advertisement, probably circa early 1960s, shows Sergeant Dan has disappeared. Ref Eph-C-THORP-03, Alexander Turnbull Library collection. 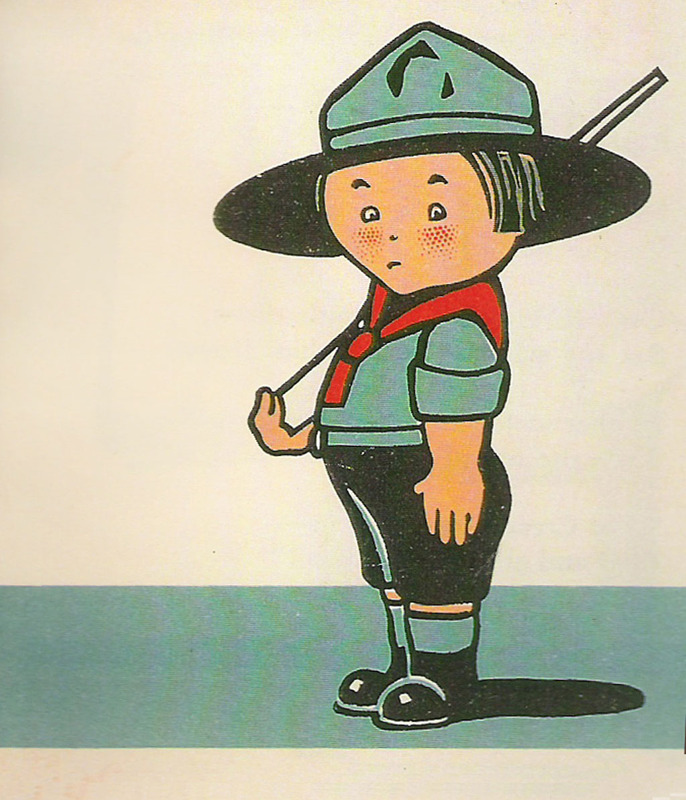 I’m not sure what era this jingle was from – but the indication of “growing up” probably interprets the period when Sergeant Dan morphed into a more adult, realistic boy scout in the fifties and, then slipped off the packages for good probably sometime by the mid 1960s to be relegated to history. Not entirely though – Sergeant Dan’s Stockfoods Ltd now occupies the later factory and make horse and calf food under the branding of the character. 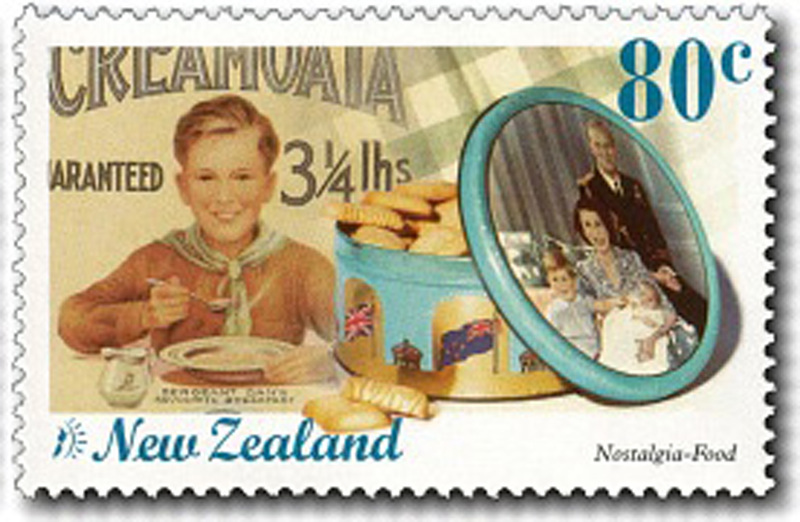 Creamoata eighty cent stamp by NZ Post within their “Millenium Series ” under a sub-category of six “Food Nostalgia” designs, issued in 1999.